You may not have heard of the Cambridge Buddhist Centre and might think that it is a slightly unusual venue for the first performance of a new opera about Rupert Brooke! 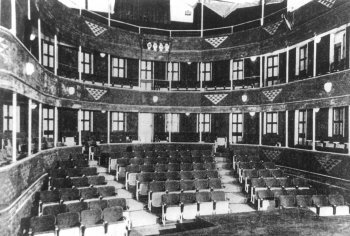 But the centre is based in an old theatre, originally built in 1814 and with one of the oldest surviving curved cycloramas. The opera receiving its premiere there is Strange Ghost by David Earl. Written for 14 singers, and chamber orchestra, Strange Ghost has its origins in a song cycle setting Rupert Brooke poems, The Ungathered Blossom of Quiet, composed by David Earl while he was living in Grantchester. Grantchester was where Brooke himself lived while studying at Kings College, Cambridge, and the well-known poem he wrote in 1912, The Old Vicarage, Grantchester, commemorates his love for both the house in which he lodged, and the area itself. The opera (with a libretto by Juliet Jenkin) which has developed from the song cycle is designed to commemorate Brooke's centenary this year. The opera consists of ten key scenes from Brooke's life. The work is directed by Dionysios Kyropoulos, a director and researcher with an academic interest in historical acting and baroque staging. The musical director is Dominic Peckham and baritone James Schouten plays Rupert Brooke. The theatre which forms part of the Cambridge Buddhist Centre was built in 1814 and known as the Barnwell or Festival Theatre. The theatre's original two-tiered galleries survive, though the boxes they contained have been removed. The theatre was originally run by William Wilkins (father of the architect) and one of them (father or son) seems to have designed it. Not much evidently survives of the original stage machinery and the theatre spent a long period in the 19th century as a mission hall. There is an illuminating article on the Cambridge Buddhist Centre website. Further information from the opera's website.